The Coppergate Helmet was recovered during excavations in the ancient walled city of York in 1982. 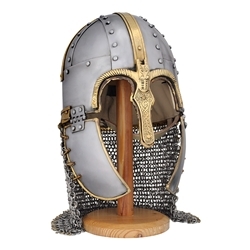 Dating from the 8th century, the Anglo-Saxon helmet is of great archeological importance. Crafted in 2mm steel with a butted ring steel aventail, this reconstruction is fully wearable with a leather suspension and chinstrap. This Coppergate Helmet is a Fully Wearable and Re-enactment Ready Saxon Helm. Approx. 25 1/2 Inches around, 8 Inches side to side, 8 Inches front to back.